November | 2005 | Planet Geek test site. Okay, this is too fun. Do you read Planet-Geek? Are you a friend or someone connected up with me in some nefarious way? Drop a marker on the map over on Frappr.com. It only takes a second, and there’s no signup process. MythTV Project update – Yay real screens! Well, this weekend saw a bunch of advances on the project. 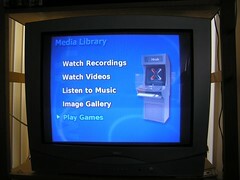 The biggest was figuring out, much to my chagrine, that my Toshiba television did in fact have an S-Video input on it. Doh! I patched that puppy in tout de suite, and got an immediate full color image up on the screen. Hooray! With that cable patch, we were pretty much set. Movies, live tv, dvd’s, music, etc – all were working properly. We even stopped having the lockup problem on MythMusic when going to full screen visualization. We’re not 100% there yet. XMame is acting unusually twitchy when it comes to screen resolution. Some resolutions work okay on the external monitor, some do not. I can tweak the xmamerc and get SOME of the games working, but others will stop functioning all together and bomb out on startup. I think I’m getting closer and closer to the time where I’ll need to do a Myth build from scratch on the box, building the code from source (rather than use Knoppmyth). There’s too many problems with the Knoppmyth distribution that I cannot repair without an upgrade (like broken MythGame sorting, MythWeb upgrades, etc). But for now, I have a stable, useable box. MythTV Project update – Bad card, Good games! I had chalked this weekend to put in some work on the MythTV Project. As of mid-day Saturday, it’s been a mixed bag of results. I received my replacement MX4000 AGP card from Newegg right as scheduled, and proceeded to install it into my system. The problem happened when I tried to remove the old card which had gotten pretty badly wedged into the slot. I believe I ended up cracking the slot (an AGP card is a ‘double-depth’ card, which means it goes pretty far into the motherboard). I installed the new MX4000 card, and apparently didn’t quite get it in place properly, because after 5 minutes of use, I was getting noise on the screen and corrupted video. No amount of swapping, reseating, fiddling, or whatever has solved the problem, so I’m RMAing the card back to Newegg, and trying a new one. Alas, I’ve had to go back to my old nVidia card in the meantime. On the good side, I did some more work with MythGame the plugin for MythTV that acts as a front end to XMame, a wonderful arcade emulator. After populating the machine with the ROMS I had (all legally, natch), it took some noodling to get MythGame and XMame to configure properly. I’ve narrowed down a lot of the problems to the fact that the KnoppMyth folks rolled a ‘mid-development’ version of Myth out with their last ISO image, so many things are only half completed. I won’t be able to use the new ROM SQL database stuff yet, but ‘big browsing’ (using just filenames) -is- working. I also picked up a pair of Thrustmaster (yes, thats really the name) USB joysticks from CompUSA ($9 each. Cmon), and Debian Linux picked them up automatically. I had to tell XMame to use the joystick (putting ‘joytype 1’ in /etc/xmame/xmamerc), as well as some other minor tunings (always run fullscreen, here’s where the rom dir is, etc etc), but after that it’s been working great. I have to decide whether the handheld controllers would be best, or if something like an X-Gaming controller is needed. However, in the time it’s taken to write this article, my friend and my wife and my son are now gathered around said system playing Gauntlet II on the handheld controllers. That may have answered my question for me. Minor update – Something is amiss in my USB setup. The joysticks have a tendency to disappear off the bus and not reinitialize. A hard reboot seems to fix it, but not exactly an optimal situation. Stay tuned. “Wizard is about to die!”. Ahhh. So a few days ago I posted a link to a fellow who had programmed all his christmas lights in time with a Trans Siberian Orchestra track. I sort of mused, being the geeky fellow that I am, how this could be done in a reasonable budget. Hackaday to the rescue! They pointed me at this wonderful site that gives full detailed howtos on building controllers to drive your own lights display. Not that I need another project right now. Our new team in Seti@Home BOINC processing is cranking away. All the user information has migrated into the BoincStats.com system, and our ranking is rapidly climbing up the ladder. I have to admit seeing full statistics and graphing stuff like this representation of the Stonekeep team is just too cool for words. We’re ranked about 17,000 out of 31,000 teams right now, and I expect that’ll climb steadily as our total credit keeps going up. If you haven’t joined already, feel free to add your machine to Cluster Computing and Yak-Shaving division of Stonekeep Consulting. Another reason I detest Windows. Folks are well aware that I’m not exactly a screaming Microsoft advocate. While I concede they’ve done more to advance and stabilize the concept of ‘Computers for Everyone’ than virtually any other manufacturer (save perhaps Apple), they’ve done so in such a poor, disorganized, and ruthless fashion, it’s resulted in a global environment that is virtually impossible to be productive in without spending enormous amounts of time and money on licensing, virus protection, system tuning, configuration, and security auditing. I offer as evidence, dear readers, my experience trying to set up my son’s computer this afternoon. It’s installed with a (licensed!) copy of Windows 2000, running on an AMD Duron 850mghz machine with 512meg of RAM. No slouch is this machine, and the goal today was simply to get it to the point where he could run his Reader Rabbit game. What follows is a Rant. Read at your own risk. From a pointer noted on gdaniels‘ LJ.